I ended our last blog writing about the cruisers on Big Run, Sharon and Bob, and how we might not see them again. In a large anchorage, they were right next to us in their trawler and we happened to sit down at DeShaMon Restaurant next to them. This morning, Mark took Daisy ashore and instead of going to Government Dock where the dinghies can tie up, he went to a beach near us. Coming back to the boat, he passed Big Run. They stopped him and asked if we wanted to go south with them today. They were leaving in a half hour, and it usually takes us at least 45 minutes to get the dinghy up, roll the sun shades up and get the boat ready to sail. Mark didn’t want to hold them up, so he said we weren’t quite ready and they left a short time later. 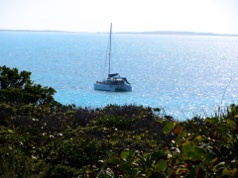 Our plan was to leave later in the day to go to Big Farmer’s Cay, a several hour sail. However, we decided to get ready to go quickly and try to catch up to Big Run. They were going through some very shallow water in the Pimlico Cays today which we couldn’t do without someone leading us through, since we had never dared take that inside route. Normally we would go outside on the Exuma Sound for that leg of our south run. But they had been through those waters before and had good waypoints. If we could follow them, it would be a new experience and give us an alternative route. Their draft is only one inch less than us so if they weren’t going aground neither would we. Eventually we caught up to Big Run and they took us through some very skinny water. At one point there was less than a foot under our keel and we were at high tide. The colors of the water are incredible, varying by depth. We went all the way to Lee Stocking Island, which used to have a research center on it. We took a tour of it three years ago. Now there is no one on the island, but there are still mooring balls there and they were filled with about ten boats. We ended up at a small anchorage north of Children’s Cay. We left at 0904 and dropped the anchor at 1420. For part of the way we went very slowly as we watched depths. Our two boats were the only ones anchored in this very quiet, peaceful place. The wind dropped and the water was smooth. Big Run was to the left of us in this photo. 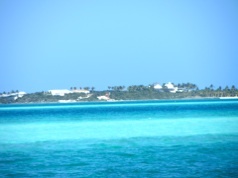 It was taken from the hill we climbed to go over to the Exuma Sound side of the cay. The photo above is us at the top of the hill overlooking the Sound. The views from this side of the islands are dramatic with waves crashing up on the rocky shore. 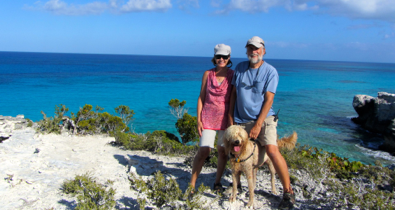 This island has some sandy beaches on the Exuma Sound side, so we climbed down and walked on them. Daisy found a big stick to chew on. After we finished our walk we climbed back to the top of the hill and realized Daisy’s Gentle Leader Harness was not on her. We had taken her leash off on the deserted beach, but left her harness on. Mark walked back and found it at the farthest place we had walked, the very spot where Daisy was chewing on the stick. If you look very closely at the photo I took of her, you’ll see her Gentle Leader just to the left of her head. 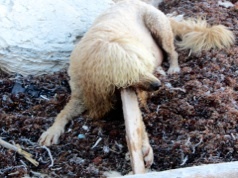 It probably fell off when she was digging for the stick. 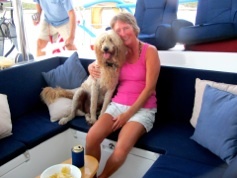 Back on the boat, we invited Sharon and Bob over for grilled burgers. I had made whole wheat hamburger buns while we were on our way south. As you can see, Daisy has found a new friend. Big Run invited us to join them tomorrow on their trip to Long Island. We were going to invite ourselves to join them anyway, so we quickly accepted. We wanted to go to Long Island when we were in Georgetown in 2010, since it’s a short trip from there, but we ran out of time. It is great to be going with someone who has been there. Click here for some photos of the beautiful scenery we saw today.